Thunderbolts is far from being the shining jewel in the crown of the Marvel Now Universe. At its best it is a fun read peppered with an ample amount of violence, intrigue and witty jabs dealt out between team mates. 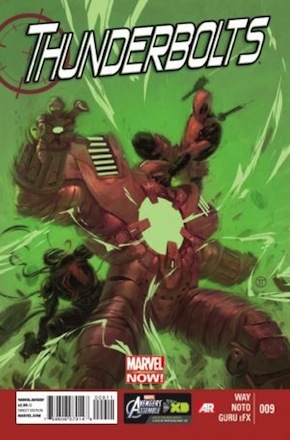 I started reading it for several reasons – the first was because I loved the previous incarnation of the book when Thunderbolts was a team of villains led by Norman Osborn during his days as head of the Dark Avengers. The second reason was the current team’s diverse albeit volatile line-up featuring the likes of Deadpool, Punisher, Venom, Elektra, Red Leader, Red Hulk and the very mysterious Mercy. The final was that the very awesome Steve Dillon was going to be handling the artwork. I have always liked Daniel Way as well, so the fact that he was going to be writing the book didn’t hurt. Now having said all of that, I have not been completely won over by the effort thus far. The opening story arc was fair, pretty straight forward but with hints at a flimsy sub-plot of a love triangle between Deadpool, Elektra and Punisher. This has been lingering on the periphery of the main story for months now with no resolution in sight. This brings me to my next point. Daniel Way is no stranger to writing Deadpool – in fact he has written some of the best Deadpool stories to date, so why does it seem like he has no idea how to use him here? If it is a question of Deadpool working well as part of a team, I would point out Rick Remender’s very fine job of doing just that in his turn on X-Force. So now the question is, if after working the bugs out of the team and changing from one excellent artist to another, in this case bringing on Phil Noto, is Thunderbolts headed in the right direction? Let’s take a look at issue number nine. The story is mostly maneuvering and behind the scenes scheming, and is heavy on intrigue. The most memorable action sequence is one in which Red Hulk single-handedly dismantles an entire unit of enemy agents all wearing Crimson Dynamo armor. Deadpool spends most of his time in this issue languishing on the floor healing from a gunshot wound to the head he received last issue. It’s not until Red Leader finds him that we see him awake and on his feet again in time to witness Red Hulk and Venom save the team from suicide bombers in Crimson Dynamo armor. The damage sustained from this sends Flash Thompson to the hospital where he has a rather bizarre sports-themed nightmare in which the Venom symbiote is a football. This all leads up to a big final page reveal that ties one of the team to a cryptic character from the recent past. One thing Thunderbolts does not lack is potential. The creative team is top-notch, as are the characters on the team. I think this book will hit its stride, but right now it is struggling under the weight of its own high expectations. It’s not a bad book but it’s just not as good as it should be given all the advantages it has going for it. Even the artistic change was one that worked – Steve Dillon is great but Phil Noto has a style that is better suited to this title giving the book a visual direction that more readily lends itself to action sequences. As for the writing, Daniel Way needs to play to his strengths, put Deadpool to better use and downplay the moral drama. I’m not sure this is a title that benefits from a love triangle. He needs to work on the team dynamic here and get us to care about how these characters interact, form some friendships among the various team mates. Let us see the human side of these guys. Way is capable of writing some fantastic dialogue and I would love to see that here. All things considered Thunderbolts is by no means a throw-away. It’s just been slow to build up any momentum and as I have said the bar is set pretty high for this creative team but I believe they will deliver. I’m going to stick around for the long ride – the talent is there, the material is there and it’s just a matter of time before all these elements align themselves and we are talking about who has been cast in the Thunderbolts movie (I assume Joss Whedon will be directing). Hey, if the comic has a dream sequence why shouldn’t the review! So until next week, as always, see you at the comic book store. I personally can’t stand Dillon’s work so I was very glad to see Noto come on board. 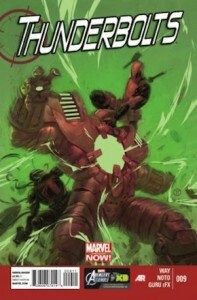 That being said, Way’s take on the Red Hulk still hasn’t won me over.